In capture cap tubes, the applicator stick is securely attached to the tube cap, allowing the sample-taker to use the cap as a handle. Ordering Information: Kits are packaged 50/box, 10 boxes/case. Each sterile, single-use kit consists of a polypropylene screw-cap tube containing 1mL of Liquid Amies Medium and applicator swab with flocked nylon fiber tip. 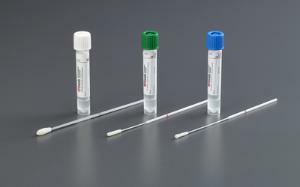 After collection, the swab drains spontaneously and completely into the medium, providing up to 10 identical 100µL aliquots for multiple testing.